As soon as the sun comes out, Brits love to barbecue. It’s a like a rite of summer passage. If you have one planned and the weather forecast changes, tough. You grit your teeth and do it anyway. Of course we have to pay a monthly service charge for said gardener and are at the mercy of the dictatorship management company, who come up with all sorts of silly rules like you can’t leave your car parked in the same place for more than 48 hours and…more importantly…you can’t have a barbecue. Now part of me understands the logic in this, because our balcony railings are made of wood and, if one flat goes up in flames, it’s likely to spread quickly. I also believe that, as a responsible adult (ahem) with a mortage and an insurance policy and a lack of desire to burn myself and all my possessions, I should be allowed to make decisions about my own property and what’s best for it. Unfortunately the gestapo management company obviously has spies everywhere, because last time we flouted the rules and cooked like cavemen, with fire, we received a letter in the post within two days reminding us that we have no power to live autonomously and they will send hungry wolves round to tear us limb from limb if we do it again (exaggeration may have been used here). Undeterred, the husband has a plan B. An electric barbecue. 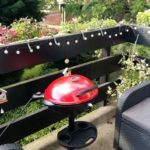 Now, said electric barbecue was ordered when we had that blink and you’ll miss it couple of days of sunshine earlier this month. By the time it arrived it was raining, and seemingly has done ever since. If it’s been raining where you are then just blame my husband and his silly Amazon ordering finger. Nothing like making summer plans to put a halt to summer, eh? We’d be better off sticking a pole in the lid and using it as an umbrella for all the use we’ve had from it so far. But we clung onto the fact that things can only get better, right? It can’t rain forever! And filing that, we’d just bring it inside and use it on the dining table. An indoor barbecue! You can’t do that with real flames…. Unbelievably, despite the fact I needed an ark rather than a car to get to work this morning, this afternoon tuned into a beautiful summer day which continued into evening, and were able to christen our new purchase. Hurrah! Here it is all set up, and in cooking action! 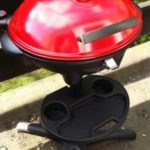 You can find the Andrew James electric barbecue on Amazon. 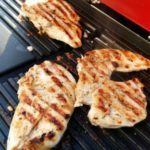 Are you a barbecue fan?